Eating steamboat aka hot pot at home is always fun… and warm, and one of the best meal options for small gathering purposes. 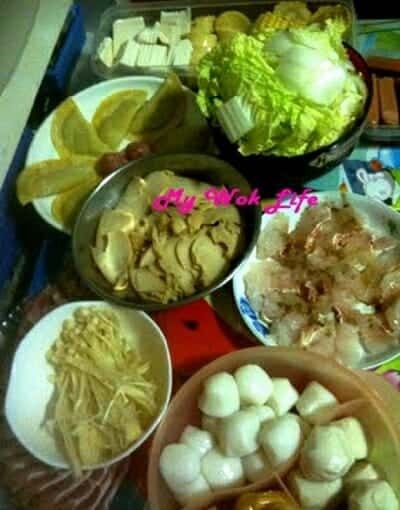 I liked having steamboat. It’s light, savory and great for varieties. Oh… I liked varieties… (laughing). I had this craving for steamboat, but limited to homemade one. So, I got my mum to go marketing with me. Chose only our preference food for this dinner! And wait, for Singaporean to have steamboat meal, the condiment/ sauce for dipping is important, just like many steamboat foodies in Hong Kong, steamboats steamboat restaurant to provide a spread of condiments and sauce, is something these patrons would expect, at least… And to me, I didn’t know how to make good dipping sauce for my steamboat meal at home, sad to say the truth.. So, I have to make sure my soup base for my steamboat meal is the key we could count on… Then, come the store-bought sauce. And so, in my post right here, I would like to share with you the recipe of my tasty and simple clear soup base. Bring all ingredients into a boil and simmer for 30 minutes before heat off. Do you have any better choice to share? What would you like? Oh, before I forget…. There is this latest favourite store-bought dipping sauce of mine. I would like to recommend it to you. This is so far the best steamboat dipping sauce found on the shelves, the sesame chilli dipping sauce! Want to know more about this dipping sauce and how to elevate the taste of this sauce in order to maximize your steamboat eating pleasure? Check out my Facebook Page. Just checked, the details were at my FB page dated back in August 2012. Anyway, it’s Dancing Chef (佳味) brand Suki Dipping Sauce. Bought it at NTUC Fairprice at $1.90 only. Not sure if they are still carrying it ya..
Just saw and found that NTUC Finest is still carrying this Dancing Chef dipping sauce. FYI, please.